Well our wedding season has started again. We've had two Feburary weddings this month and it's making us reflect on what a fabulous season we had last year! We've been going back over some of the beautiful weddings we shot last year and haven't gotten round to posting on the blog. Top of the list of weddings to feature was this Quintistentially English Countryside wedding out in the middle of the Norfolk. Karen & Tommy are some of the coolest people that you'll ever meet. They both work in media in London and Tommy is a very talented photographer in his own right. 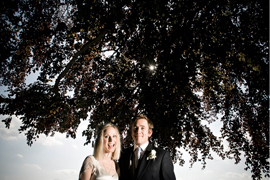 They were married at Tommy's Dad's family home (a gorgeous thatched cottage) in such beautiful surroundings. There were two marquees, stylish guests, perfect weather and oh yes, two Mariachi musicians!!! Tommy had spent the previous months scanning pictures of every single wedding guest to use as personalised place names. Karens mum had also spent the past two years making bunting for the big day. The marquee just looked so perfect and Karen admitted to me that she hadn't looked at a single wedding magazine or blog, she just did it the way they wanted and we think that is shows, it really was a perfect day!!! If you want to see images from their fun photo booth have a look here. And if you want to see their engagement shoot have a look here.